In the first few days of August, the foreign ministers of the GCC, Russia and the U.S. descended on Doha, Qatar, for talks. 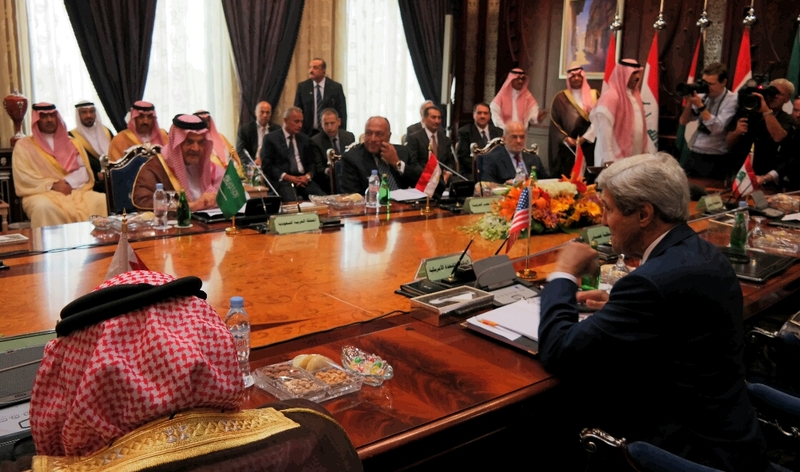 The U.S. Secretary of State, John Kerry, assured GCC foreign ministers that the risk Iran poses had been greatly minimised as a result of the Iran nuclear deal. Secretary Kerry had just been to Egypt where he assured his counterpart, Sameh Shoukry that “There can be absolutely no question that if the Vienna plan is fully implemented, it will make Egypt and all the countries of this region safer than they otherwise would be or were”. Secretary Kerry clearly wanted to secure the support of America’s crucial Persian Gulf allies for the deal in a bid to give it more credibility, as the Obama administration is currently fighting to prevent a Congressional attempt to derail the deal. The GCC states gave Kerry tacit support for the nuclear deal, saying that it should bring stability and “good neighbourliness”, rather than interference. Qatari foreign minister, Khalid al-Attiyah said the alliance wanted to spare the region “from any dangers and threats from any nuclear weapons.” He said that this should be done by authorising the use of nuclear power for peaceful purposes in line with international rules. Many Gulf States are worried that the agreement will quicken reconciliation between Tehran and Washington, emboldening the Islamic Republic to support their paramilitary allies in the region. A curious and clearly significant meeting occurred on the sidelines of this GCC meeting, where Secretary Kerry held trilateral talks with the Russian foreign minister Sergey Lavrov and Saudi Arabia’s foreign minister Adel bin Ahmed al-Jubeir, regarding the Syrian Civil War. Ever since the Iran nuclear deal, which Russia helped in securing, Moscow has been ramping up its once low-key foreign policy in the region. There has been a marked rapprochement between Saudi Arabia and Russia, with the Saudi Minister of Defence Mohamed Bin Salman recently meeting President Putin. This trilateral talk between Saudi Arabia, Russia and the U.S. marks a significant rise in not only Russia’s foreign policy presence, but also of Saudi Arabia’s. The meeting looked at ways forward for the Syrian conflict, and attempted to find common ground in the fight against ISIS. Secretary Kerry announced that the US would defend moderate Syrian rebels against any attack, thus suggesting it could target Syrian government troops in future. Mr Lavrov condemned this new strategy and said it would be a violation of international law and represents an obstacle on the road to forming a united front against terrorism. He added that Russia provides military and technical support to the Syrian government to fight ISIS, just as they provide support to Iraq to do the same. Kerry stressed Washington’s commitment to supporting anti-ISIS fighters on the ground but also, that Assad’s “brutality” against Syrians is helping incite foreign fighters to join ISIS. At least publicly, Secretary Kerry and Mr Lavrov kept to the same line they have maintained since the onset of the conflict. Another meeting that was not reported in the press and is worth mentioning was Sergei Lavrov’s meeting with former chairman of the National Coalition for Syrian Revolutionary and Opposition Forces Moaz al-Khatib during his working visit to Qatar. They focused on discussing the situation in Syria and emphasised the need to find political settlement of the Syrian crisis. Moaz al-Khatib is arguably one of Syria’s most respected opposition figures and one possible reading of this meeting is that it is hinting at Lavrov’s diminishing faith in Assad. The West loves Moaz because, as one NCF member put it, “He doesn’t throw all his toys out of the pram”. At the end of last month Syrian National Security Bureau chief, Ali Mamlouk visited Riyadh, Saudi Arabia to have an unusual talk with the Saudi Deputy Crown Prince, Mohammad Bin Salman. This unexpected meeting has been described as “the miracle meeting”. The sit down was brokered by President Vladimir Putin of Russia who, after organising it, flew Mamlouk – one of Assad’s chief advisers – to meet Prince Mohammad. During their meeting Mamlouk appealed to Prince Mohammad for Saudi Arabia to change its policy regarding Syria, saying that Qatar was unduly influencing Riyadh. Mamlouk also thanked Russia for it’s “noble initiative” and said that Saudi Arabia and Syria both need to resolve their differences. At the same time Mamlouk blamed Saudi Arabia for everything that’s happened in Syria and accused the Kingdom of submitting itself to the will of Qatar’s ruling elite. Prince Mohammed responded to this by expressing his fears to Mamlouk that Iran was exercising too much influence in Syria. He said that Saudi’s main issue with Syria is that they let themselves be led by Iran who are involved in a large scale conflict with Saudi on the level of the entire region. The deputy crowned prince ended the discussion by saying “may this meeting be an opening for us to talk to each other”. The two parties agreed to maintain communication but did not arrange a date for another meeting. While these talks were happening, several Arab newspapers published an article written by Iran’s foreign minister, Mohammad Javad Zarif, asking the GCC states to work with Iran to counteract instability in the Middle East. As optimistic as the tone was, the reality is that Iran and Saudi Arabia remain arch-rivals in the Middle East, and the recent incident of a deadly sectarian bombing in Bahrain suggests that Saudi-Iranian competition won’t be abated anytime soon. How genuine is Turkey’s input into the fight against ISIS? Turkey’s reasons for its newfound interest in assisting the US to work against the Islamic State of Iraq and Syria are questionable. Though Turkey are now fighting against ISIS, they have an ulterior motive for doing so. That motive is to punish the Kurdistan Worker’s Party (PKK) and prevent them from growing stronger in Turkey, and by so doing possibly bolstering separatist attitudes within Turkey’s own Kurdish population. Turkey’s president Recep Tayip Erdoğan, decided to become involved when ISIS suicide bombed a town on the border of Turkey, killing around 30 people. Erdoğan now has good reason to fight against ISIS but is also using this to his advantage to prevent the progress the Kurds are making. This became clear to see when Turkey chose to attack targets around Aleppo, very close to Syria’s Northern border so that as well as bombing ISIS, they are also killing members of the PKK in the area who are threatening Turkey. Erdoğan has good reason to fear the Kurds. Should they grow stronger in Turkey it is possible they will be able to seize their own land, as they have in Iraq, creating a domino effect as more Turkish Kurds take control of yet more land. The conflict between the Kurds and Turkey is troubling. The Kurds are useful as they are bitterly opposed to ISIS because of Kurdistan’s near defeat at their hands. The Kurds have an intense dislike for the discriminative beliefs against any other religion or sect that ISIS have. The PKK and its sister group, the Democratic Union Party (PYD) have been very effective in fighting ISIS so far. More so than the airstrikes from Turkey. Attacking with ground troops as the PKK and PYD have done seems a much more effective way to attack ISIS. Erdoğan came out of the most recent election without a majority and for the first time, a Kurdish party, the Peoples’ Democratic party (HDP), entered parliament. This party has historic ties to the PKK and their success was thought to mean the the relationship between the Kurds and Turkey was at last improving and the country was moving forward. It looks like Erdoğan might be hoping that by attacking the PKK and encouraging the anti-Kurdish sentiments of the Turks, he might win the the majority in a snap election should there be one. Erdoğan has suggested that the HDP could be prosecuted for having ties with the PKK. He makes it clear that peace is no longer a possibility. On the other hand, we need Turkey. Having them as an ally means that the US are able to use its Turkish base, Incirlik, to keep aircraft in the skies above Iraq and Syria instead of using the aircraft carriers they had to have in the Mediterranean. It is also important to have as many countries working against ISIS as possible so the chances of winning are much higher. Turkey claims it has stopped allowing ISIS to use Turkish land as a transit point to Syria. The only real solution there is, would be to encourage Turkey to make peace with the PKK and address their demands. That has to be done if we are to fully focus on the real issue which is how to wipe out ISIS.